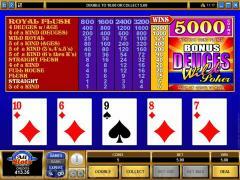 • The player establishes a bet and then clicks "Deal" to receive cards. The player makes the decision as to which cards to "Hold." Then, after clicking "Draw," the hand plays itself out to a conclusion. • The payout table, which is in full view, informs the player as to what the payout amount is for each of the winning hand combinations. • After scoring a win, the player can elect to move on to the "Doubling" phase, in which five cards are dealt - one that is face-up (the dealer's card) and four that are face-down. The player selects one of the face-down cards and if it is of a higher rank than the dealer's card, the payout is doubled. 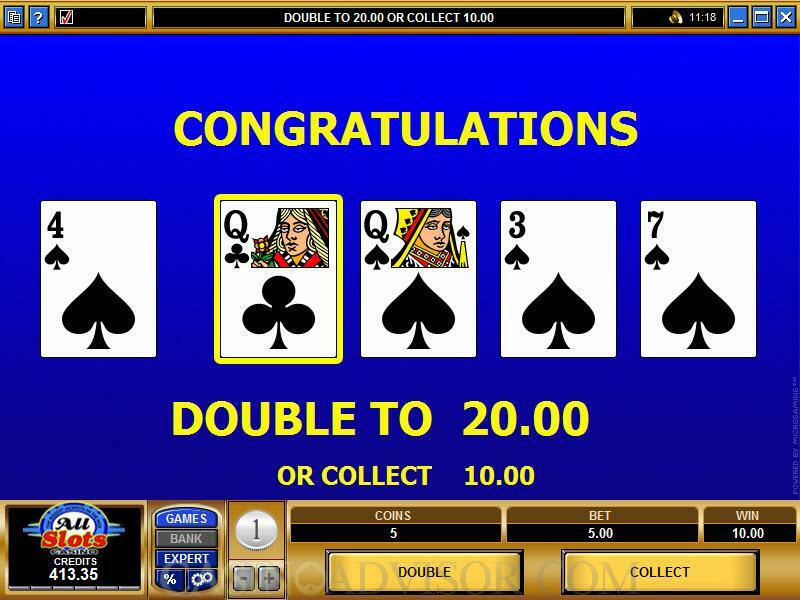 • The player can elect to double again after winning the first double, or simply choose to collect. Bonus Deuces Wild starts paying when you get Three of a Kind (five coins for a five-coin bet). 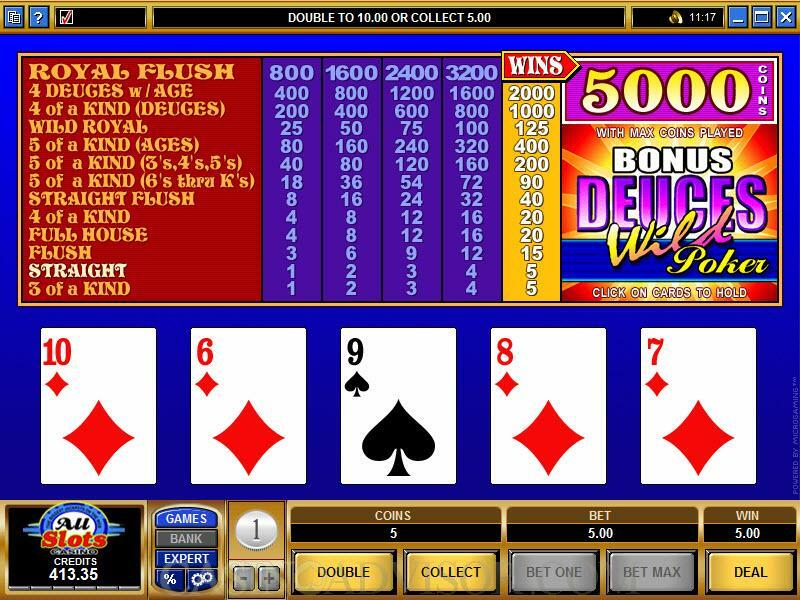 There are modest payouts for a straight (five coins), flush (15), full house (20), Four fo a Kind (20) and straight flush (40). Of course, all of thse are based on a five-coin bet. For details on payouts for lower coin wagers, please check with the pay table, which is not hard to find, since it pops up before your eyes when the game is downloaded and appears on your screen. The big-time payouts happen when you hit with the wilds. 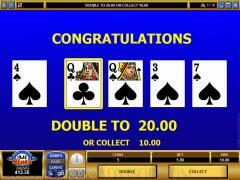 There are three different "Five of a Kind" payouts, and unlike some other versions of video poker, you will get paid more, depending on what the rank is. Here you will win more for the lower ranks. For example, Five of a Kind with anything from 6's through Kings will pay 90 coins. Five of a Kind with 3's, 4's and 5's pays 200 coins. And five Aces will bring back 400 coins on a five-coin bet. There is also a "Wild Royal," which is a Royal Flush accomplished with the help of a wild card. This pays 125 coins on a max bet. Since this is about deuces, it makes sense that a hand with four deuces yields 1000 coins, and four deuces with an Ace "kicker" brings double that. The big jackpot comes on the Royal Flush - 5000 coins.